Earn up to 9,600 reward points. 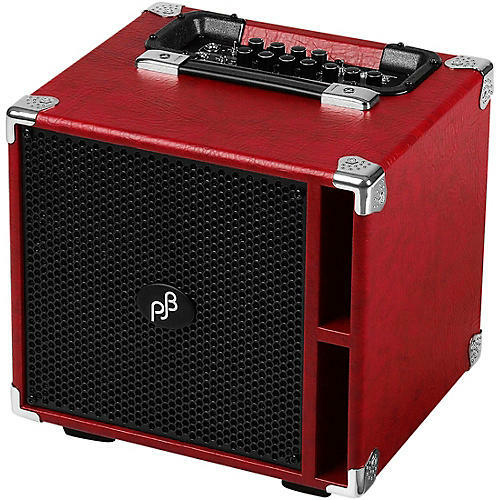 This model is based on the nu-compromised performance of the original PJB Suitcase. It is more powerful by physically smaller; in fact the same size as PJB's Compact 4 enclosure. It has an incredible punch sound cutting through air as “a knife through butter” but with a solid and powerful low end response normally associated with a much larger combo. It features a 2-channel pre-amp with PJB's unique 3-band EQ. Simple to find “your sound”, the EQ sound has amazing control and transparency that allows you to unmistakably hear the true characters of your own playing and instrument. In the heart of this amp lies a formidable ultra-energy power supply. It feeds an efficient class D power amplifier which utilizes almost 95% of this energy to drive the four internal PJB Piranha speakers. The Suitcase Compact puts out a healthy 300 watts RMS onto its own speakers. Adding a Compact 4 cabinet it becomes 500 watts, and adding a Compact 8 it becomes 575 watts. The future of amps is trending to “smaller and better” but with the Suitcse Compact bass combo, the future is here now!